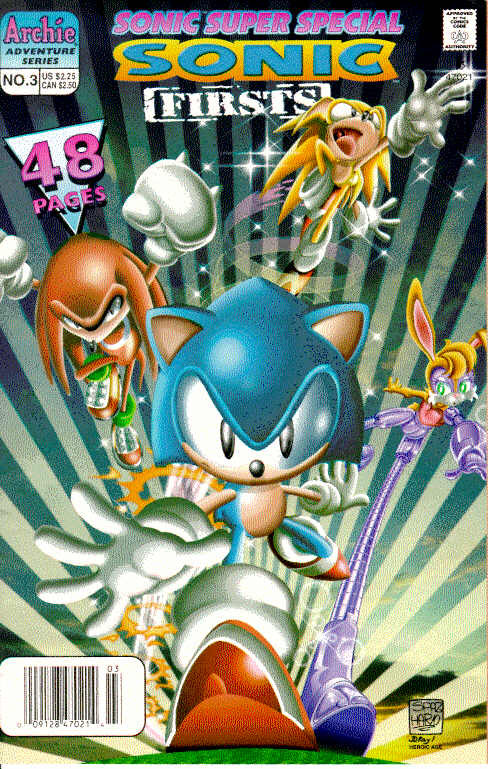 "Don't Cry for Me Mobius"
First appearance of: Sonic, Tails, Princess Sally, Rotor (called "Boomer" back then), Antione, and Robotnik. StH #0 was also the *only* appearance of Sally with blonde hair, but you can't tell from this reprint! The image on the left is from the original print of StH #0. The image on the right is from Sonic Firsts. This story was actually the back-up story in StH #3 (regular series), which followed the main story, "The Bomb Bugs Me". (Click here for page 1 of that story.) Micheal Gallagher & company try to explain how Bunnie came to be part robot. 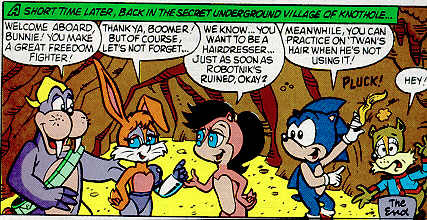 This also set the stage for those "hare salon" gags. It also contained a few puns that made me laugh out loud. Once again, the reprint was re-colored, as evident from these scans of the last panel. The image on top is from StH #3. 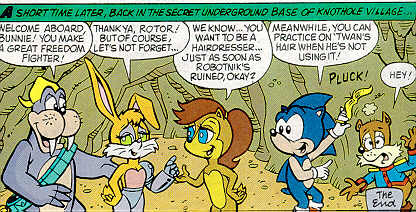 The image below it is from Sonic Firsts. See the differences? like the way Bunnie looks with lime-green eyes (as Karl keeps coloring them) *YUK! * What gives, Karl?? Robotnik creates a huge, monster robot out of a little salamander. However, the Universalamander had no interest in following evil Ivo's orders and, instead, set out to conquer Mobius for himself. Unfortunately, I do not have a copy of the original, but I *know* at least Sally was re-colored from a pink-furred brunette to the brown-furred red-head we see today. 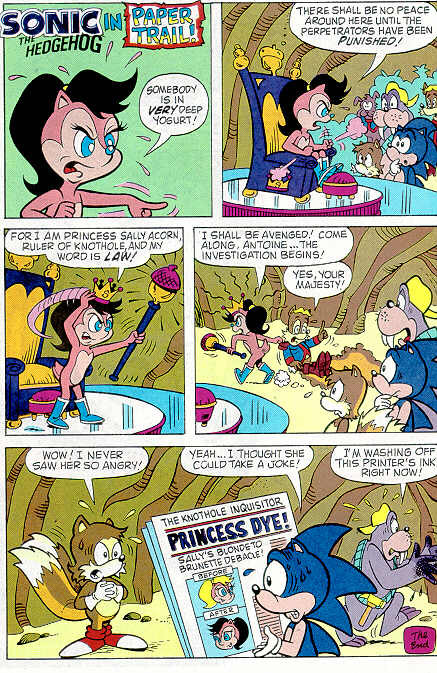 I know this because Sally was colored with "pink" fur from StH #2 (limited series) through StH #15. Well, I couldn't tell if there were any "color changes" between the two prints. 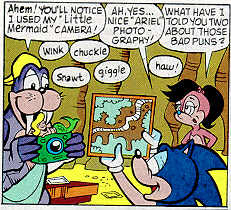 Sonic and Tails discover the Floating Island in this story and investigate. Unfortunately, Robotnik beat them there and convinced Knuckles, the island's Guardian, that Sonic has come to steal the island's Chaos Emerald (which is the thing that makes the whole island float in mid-air). 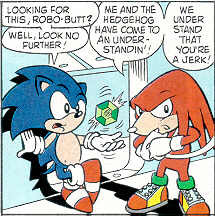 While Knuckles dealt with Sonic and Tails, Robotnik stole the Chaos Emerald. When Knuckles returned to the Chaos chamber and discovered that the Emerald was gone, he realized that Robotnik had played him like a violin. Knuckles and Sonic called a truce, recovered the Emerald, and kicked Robotnik off the island.